The Royal Caribbean Allure of the Seas has 2,706 cabins and suites, ranging in size from the 149 square foot Q category Interior Staterooms to the 1,724 square foot Royal Suite with balcony. In addition to the category classification, the price of the cabin or suite varies based on location. The Allure of the Seas has 1,956 balcony cabins, 254 outside, 496 interior, and 46 that are wheelchair accessible. Most cabins are designed for two people, and there are no single cabins. However, some suites and family cabins can accommodate up to eight guests. All of the suites have Concierge service except the Junior Suites. Every stateroom has a television, telephone, private bath, shower, vanity, and hair-dryer. Most showers have a curved glass door, and the baths have nice shelves for storage and a night light. The double closet has sliding doors and a safe. The Allure of the Seas has one Royal Loft Suite (category RL) that measures 1,524 square feet, with an 843 square foot balcony. The two-deck high suite has lovely panoramic views and closets on both levels. The balcony is larger than many of the suites on the ship, and is bigger than some in town condos! The spacious balcony has plenty of seating, its own whirlpool bath, and a dining area. The master bath on the loft level has a tub, shower, two sinks, and bidet. The suite has four twin beds that convert into two queens. The bath on the main level has a shower. The living room has a library, dining table, dry bar, piano, and a sofa that converts to a double bed. Having a private dining room with views of the sea is a great benefit of a Royal Loft Suite. 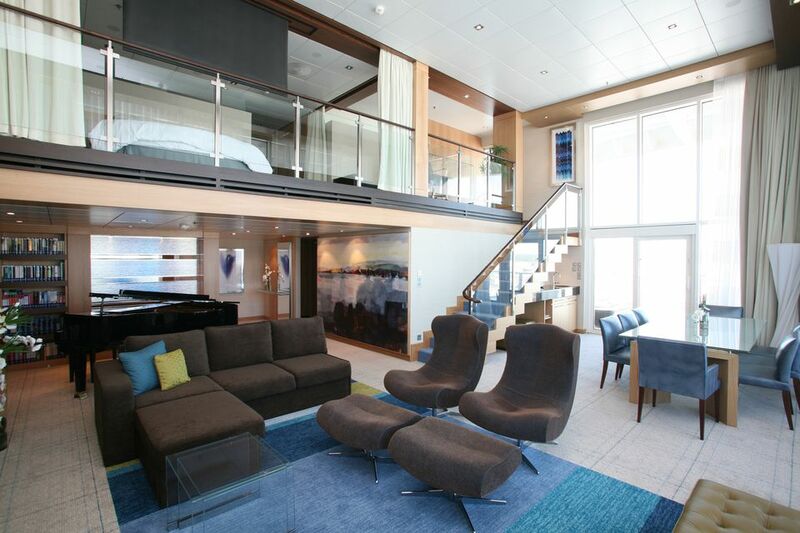 The 1,524 square foot Allure of the Seas Royal Loft Suite has its own library and piano on the first level. The master bedroom and bath in the Royal Loft Suite are on the second (loft) level. The master bath in the Royal Loft Suite on the Allure of the Seas has a tub, shower, two sinks, and a bidet. It also has wonderful natural light! The Owner's Suites on the Allure of the Seas have a comfortable bedroom, a separate living area, and a private balcony. The Owner's Suites can sleep up to 4 guests. The balcony on the Owner's Suite is a generous 243 square feet. The Allure of the Seas has 10 Owner's Suites (category OS), each measuring 556 square feet with a 243 square foot balcony. The Owner's Suites have two twin beds that convert to a queen-size, private bath with tub and two sinks, marble entry, and a living area with a table and sofa. The Allure of the Seas has 25 Crown Loft Suites (category CL). The Crown Loft Suites measure 540 square feet and have a 98 square foot balcony with nice chairs. These two-deck high cabins have a great panoramic view from their huge windows. The bedroom and master bath are on the loft level. The bedroom has two twin beds that can be converted into a queen-size. The shower is large enough for two people. There is also a bath on the main level. All of the Crown Loft Suites have stairs to the loft, but one of the suites is handicap accessible and has an elevator. The Crown Loft Suites have a dining area with dry bar, table/desk, and a living room with a sofa that converts into a double bed. The Crown Loft Suite on the Allure of the Seas has an upstairs bedroom. The Allure of the Seas has 30 Grand Suites (category GS) that measure 371 square feet with a 105 square foot balcony. Each Grand Suite has two twin beds that convert into a queen-size, private bath with two sinks and a tub/shower combination, marble entry, large closets, and a small living area with table and sofa. The Grand Suite bath has twin sinks and a tub/shower combination. Some of the Allure of the Seas suites have a separate tub and shower, most cabins have only a shower. The Grand Suite balcony is 105 square feet, double the size of a standard balcony. The Allure of the Seas balcony cabins feature one of three views--a traditional ocean view (categories D1, D2, D3, D4, D5, D6, D7, D8); Boardwalk view (categories B1, B2); or Central Park view (categories C1 and C2). There are 1308 oceanview balcony cabins, 221 Boardwalk view balcony cabins, and 254 Central Park view balcony cabins. All the balcony cabins measure 182 square feet and have two twin beds that convert into a queen-sized. The balcony measures 50 square feet. Each balcony cabin has a small sitting area and private bath with shower. In addition to the balcony cabins discussed above, the Allure of the Seas also has seven family cabins with a balcony. These family cabins sleep up to six persons, with two twin beds that convert to a queen, sofa that converts to a double, and two Pullman beds. The family balcony cabins have one bath and a small sitting area. They are larger than the other balcony cabins, measuring 271 square feet with an 82 square foot balcony. The balconies on all balcony cabins (ocean view, Central Park view, and Boardwalk view) measure 52 square feet. This bath in a balcony cabin is much like those in all standard cabins. The eight Family Oceanview Cabins (category FO) on the Allure of the Seas each measure 271 square feet. They sleep up to six guests, with two twin beds that convert to a queen, a sofa that converts to a double bed, and two Pullman beds. Like the other oceanview cabins, they have a private bath and sitting area. The four Family Interior Cabins (category FI) on the Allure of the Seas sleep up to 6 guests-- two twin beds that convert to a queen, a sofa that converts to a double bed, and two Pullman beds. The Family Interior Cabins also have a private bath and a sitting area. These cabins measure 260 square feet.